The Mercedes-Benz 500 SL has been going stiff in the Mercedes-Benz Museum for years. But now it has the chance to stretch its legs (or wheels) in the Californian desert. The 1980 Mercedes-Benz 500 SL Roadster, the rally variant R107, starts on the road at a chilly pre-dawn time. The video shows the 35-year old racer doing the dune bashing in the Californian crimson sand and running along dusty roads towered by cactuses, in the heart of the Joshua Tree National Park. 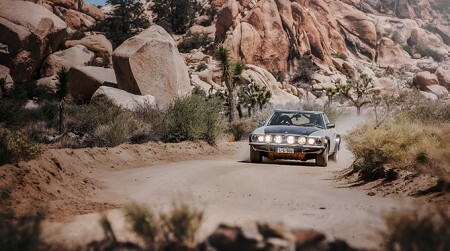 Howling through the desert on its Fulda rally tyres, the 500 SL Roadster occasionally drifts to throw pebbles and sand into the air, as if a sand storm just rose out of the blue, before it starts off again, followed closely by its reverberating soundtrack. By night, after 14 straight hours of shooting, the car stops, after covering a 421,4 kilometer distance, at an average speed of 104 km/h. Not bad for your age, old man! It may seem a monkey business, but this was no rabbit-out-of-the-hat trick. At least, we should talk about coyotes, not rabbits. A representative of the Mercedes-Benz Classic Center USA, Constantin von Kageneck, sat behind the wheel of the R 107, in the memorable adventure. This is not his usual working day in the Marketing and Communication department. The car with 320 HP, recently taken down its platform in the museum, had been one of the four especially prepared for the 1981 rally season. Six professional camera men and photographers on the ground made it happen. For the aerial views, the filming crew used a hexacopter drone. Even though it was terribly cold at dawn, the desert sun blistered soon after the morning passed and eventually hit the 52 degrees Celsius mark on the thermometer. 24 hours after they had started, the team is going back to civilization. The 500 SL is pushed up the transporter ramp. It will probably turn stiff as a museum exhibit for the next 30 years.